Fainting is a brief loss of consciousness. It is also called syncope or "passing out". Fainting happens when there is short-term decrease in blood flow to the brain. The causes of fainting can be serious or not serious. About 80% of all faints are simple faints and are not serious. People who are mildly dehydrated or fasting may be more likely to faint. Other factors include hot weather, lack of sleep, recent illness, being pregnant, or a change in altitude. A person should wake up and be alert less than 1 minute after fainting. They should feel normal within 10 minutes after fainting. If the person does not wake up within 1 minute, it is not just a fainting spell. Before: sometimes there are warning signs for 10-15 seconds right before fainting. Signs may include feeling dizzy, sweating, nausea, or blurred vision. Fainting: loss of consciousness. The person may slump over or fall to the ground. After: the person usually wakes up in less than 1 minute. The person may feel weak or tired for a few minutes afterwards. What is a Simple Faint? Healthy adults can have simple faints. They can be caused by stress, pain, standing for a long time, or standing up too quickly. About 80% of all faints are simple faints. Simple faints are also called vasovagal or vasomotor syncope. Some people are much more prone to having a simple faint than others. A person often has warning sign before a simple faint: these signs include pale skin, blurry eyesight, nausea, and sweating. Others signs are feeling dizzy, cold, or warm. These last for 5-10 seconds before fainting. Simple Faints - Why Do They Happen? Prolonged standing in one position before fainting: this is called orthostatic syncope. This is a common cause of simple faints. It most often happens at church, graduations, weddings, school assemblies, and parades. It happens more often to people who keep their knees "locked." It is caused by blood pooling in the veins of the legs. Any person who stands in one position for a long time will faint. Standing up suddenly before fainting: this is called orthostatic syncope. This can happen to most people if they stand up too quickly after lying down. Usually this just causes dizziness rather than fainting. Sudden fearful or disgusting event before fainting: this is called vasovagal syncope. This can happen after seeing someone vomit, bleed, or pass a stool. It can happen after seeing a badly hurt person or pet. It can also happen while getting an injection or performing in public. Sudden physical pain before fainting: this is called vasovagal syncope. This can happen after getting an injection or having stitches taken out or blood drawn. These faints are most likely caused by stress rather than pain. Each of these suggests that the fainting might be from a more serious cause. Lie down with your feet up for 10 minutes. Simple fainting is caused by a short-term decrease in blood flow to the brain. Lying down helps blood flow to the brain. Drink some fruit juice. This is important if you have missed a meal or not eaten in over 6 hours. What to Expect: Most people feel better after lying down for 10 minutes. Fainting most often has early warning signs. These include feeling dizzy, cold, or warm. You may have blurry eyesight or a stomachache. If you feel these warning signs, lie down right away. This will stop you from falling down. You only have 5 seconds to act. It is very unlikely that you will faint if you are lying down. If you can't lie down, you should sit down with your head between your knees. Standing up too quickly after lying down may cause you to feel dizzy. It is caused by blood pooling in the veins of the legs. Because of this, for a short while there is less blood flow to the brain. It is most often not serious and it can be prevented. When getting out of bed, sit on the edge for a few minutes before standing. If you feel dizzy, sit or lie down. Water and salt are key. 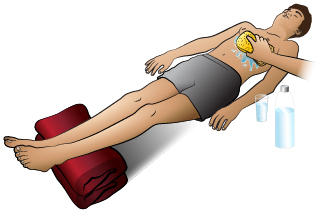 If you faint often, drink extra fluids every day. Add some mildly salty foods like saltine crackers or soup to your diet. Standing for too long in one position is a common cause of fainting. It is most often not serious and can be prevented. If you must stand for a long time, contract and relax your leg muscles. Do this every so often while you are standing. This will pump blood back to your heart. Try to avoid standing in one place for too long with your knees locked. Some people faint if they go through a painful, frightening, or emotional event. Examples include getting an injection, having blood drawn for a test, or getting injured. Some people pass out just from seeing blood. For some people, this is a normal reaction and shouldn't cause any lasting effects. It is caused by blood pooling in the legs. It is also caused by a short-term decrease in blood flow to the brain. If you know you faint under certain circumstances, lie down in advance. Try thinking about something else. Think of yourself on the beach or with a friend. You can also learn relaxation exercises. This is where you relax all of the muscles in your body. Give glucose by mouth IF able to swallow. Note: In this illustration the individual in shock is laying down and his feet have been placed up on a stack of blankets.